Every time when I have a craving for brownies, I immediately think about these cream cheese brownies. I found this recipe inside a box of the Baker’s semisweet chocolate quite awhile ago, and have been making these cream cheese brownies ever since. These brownies are very moist and fudgy, and are exactly what I want. Preheat oven at 350 degrees F. Grease a 9" X 13" baking pan. In a bowl, melt chocolate with butter over hot water or microwave chocolate and butter in a microwaveable bowl at high 2 minutes. Stir until chocolate and butter are completely melted. Gradually add sugar. Continue beating until thick and lemon colored. Add vanilla and chocolate mixture, mix well. Beat cream cheese with butter, vanilla, sugar and eggs until smooth. To finish brownies, layer half of chocolate batter in greased baking pan. Spread with cheese mixture. Top with spoonfuls of chocolate batter. Swirl with knife through layers to marble. Bake for 35 minutes. Let cool. Cut into squares. Hi Evelyn! Wow, this looks so good! I haven't had brownies for a long time...The cream cheese in the brownies sounds delicious. I guess you can taste the little creamy and tangibleness from the cream cheese? The marble pattern looks very pretty too! Thank you, Nami! 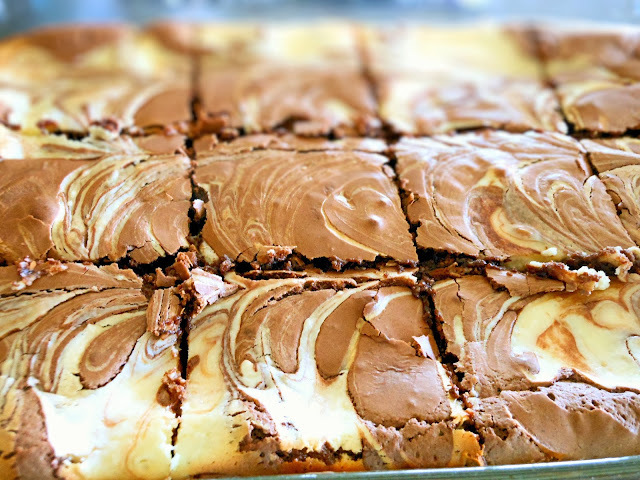 The first time I ever tried the cream cheese brownies is when I was in Phoenix, Arizona. They were so delicious. So happy that I later found the recipe. Hope you will give it a try. Thanks for your nice sharing. Keep it up.